We bought this house with a guest room in mind, but as time goes on and understanding the practical everyday needs of our house, the idea of having a whole bed set up 24-7 in our downstairs bedroom/office just doesn’t make sense. And with the holidays quickly approaching and family and friends coming out to visit us more, we have been working on creating a comfortable space for overnight guests. So we started researching sofa sleepers to make the office a usable room by day and a comfortable get-away by night. Since our house is older and the rooms are on the smaller side, we have been in search of a smaller footprint sofa bed that also fits our style and wont break the bank. After combing through what seems like hundreds of outrageously, ugly, and poor reviewed sleepers for thousands of dollars (yeah, no thanks - we have windows we want to replace! ), I have rounded up six stylish yet affordable sleeper sofas! So we bought a house! Danny and I made a giant leap this year and pulled the plug on moving to Portland, something we have been discussing for years. So what a better push than buying a house. We got serious about looking in August and by September 13 we put our first offer in on a 1920's bungalow located in NE Portland - sight unseen. Before we even stepped foot inside, we knew this house wasn't our style as-is. It's on the darker side, was possibly "updated" in the 80's or 90's, some walls are blue, some are purple, yada yada. But one thing we didn't know until we got there was really how much potential this home has. And THAT was exciting! We quickly started bouncing ideas off each other and for me, this really is a dream to finally be like Joanna Gaines and fix this house up! Minus the shiplap. So, of course, the first thing I focused on was wanting to gut the kitchen... and I wanted it done before we moved in... and I wanted it done now. But as life has it, we ended up having to move quicker than anticipated because we have to work, right? So, we accepted having to live in the house in it's current state for a while. Now, people told me to "live in the house first" before you start any work, to really get "feel" for the home. And you know what? They were right. Because now we realize the bathroom is the first to go! So here we are. This bathroom... wait, let me rephrase that: This toilet, is a nightmare. I am usually all for old things, but this pull-chain toilet has got to go - and fast! I can no longer pee in fear! I am creeped out by the older linoleum floors and counter tops, the un-centered mirror makes me cringe, the brown-blue combo is dated, and I swear the "lovely" oak vanity was made for really short folk because I am 5'4 and this thing hits the top of my legs. 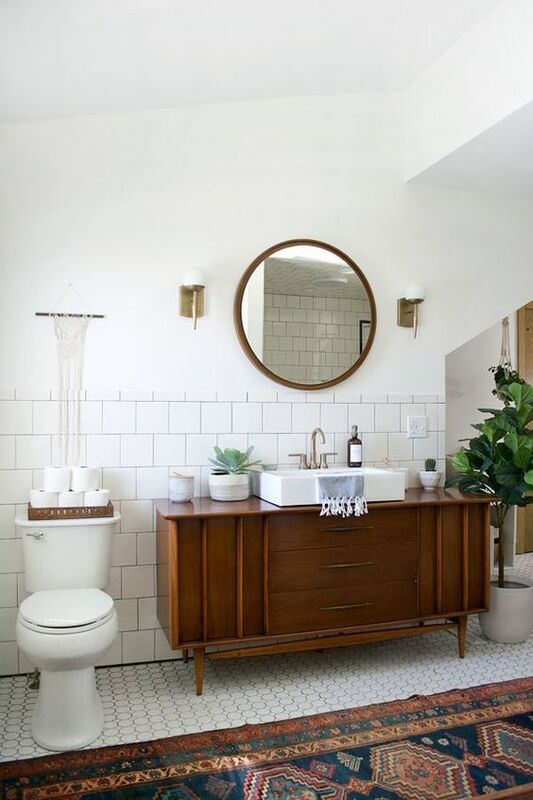 We really want a minimal, clean, and somewhat modern bathroom, but since the house is old, we we want to restore its charm and vintage look while introducing a somewhat modern, updated style. Let's call it "vintage-modern". Aside from painting the walls white, we want to remove the stained glass window (and re-purpose it elsewhere) and install a casement window. We'll likely use the large round mirror we purchased from Ikea earlier this year and flank it with vintage-inspired brass sconces with matching brass fixtures (though we may stick with stainless to not be too trendy). We'd like to re-tile the shower with a matte subway tile, replace the floors with a white, hexagon tile and a light grey grout, and replace the ancient toilet with a Toto brand, because, as my Dad told me about his Toto toilet: "That mother-effer will flush anything." Lastly - and my FAVORITE part - we'll be re-purposing one of our many mid century credenzas (I don't have a problem... you have a problem) that I insisted we schlep up to Portland, transforming it into a vanity (this will be a HUGE money-saver), and placing a rectangular vessel sink on top! If all goes as plan, I may never leave the bathroom! Happy Friday! I got really good feedback on this new section and some requests for dressers and credenzas so I scouted for a few. Hope you enjoy this week's edition of Coming in Hot: Craigslist Finds! Looking for something good? Let me help you! Send me a message and I would be more than happy to help you find the furniture piece of your dreams! This is my blog on lifestyle, travel, cooking, & home decor and renovations with my husband & dog. Get posts in your inbox!